I expected the think/do/write articles to fare better, but I didn’t realize that they’d average almost 100% better. That’s pretty telling, isn’t it? If you blog about business or money, quit writing about how to make a million dollars online until you’ve actually done it. If you want to make a million dollars online, but haven’t yet, go make $10 and then report back on how you did it. Build up from there. If you’re a travel blogger, write about the unique experiences you’ve actually had, rather than about the places you want to go but haven’t gotten to yet. When Darren writes, he doesn’t publish posts about how he’d like to grow ProBlogger, or how he’d like to try an experiment on Digital Photography School. He goes and actually does it. Then, he comes back and shows you how he did it—and talks about why it did or didn’t work. So, how do you actually do this process, when life is filled with so many balls to juggle? Here’s the process I use to make sure I’m not just doing stuff and writing about it, but doing important stuff that people will want to read about. Why do you blog? It probably has to do with a lot more than just getting attention, right? You set out on a journey to inform the world about something, didn’t you? In my case, I want to show the world all the benefits of risk taking. That means I set out on a regular basis to do things that most people think are too risky. The challenges are what keep me going, and keep things interesting on the blog. You probably have some big goals for your blog, like getting to a certain number of subscribers or a particular amount of page views per month, but those are arbitrary goals. Unless you write specifically about blogging, no one really wants to read about those. What challenges are you taking on that are related to your niche and would inspire your readers to do something similar? We lead busy lives, and the famous Parkinson’s Law says that however much time you allow yourself for a task—that’s how much time it will take to do it. Let’s face it: if there’s no deadline, I’m probably not going to do it at all. If I give myself plenty of time, I’ll eventually get bored and probably give up. Or, the deadline will be so far away that the goal isn’t really compelling. But what if I give myself a really short deadline that I’ll have to work my tail off to meet? Not only do I stay engaged, it’s a much better story for readers as well. Even if I fail, the story is fun to follow and people learn something. I can’t tell you how many times I’ve done something I thought would be worth writing about only to realize that I never recorded any of the details. I end up struggling to make any sense out of it when I sit down at the keyboard. Nowadays, I carry a small video camera almost everywhere I go, because who knows when the opportunity to capture something compelling will come along? Don’t just write about what you’re doing. Find ways to incorporate video, audio, pictures, or other media into your story. Not everyone learns or makes connections by reading even though most of us, as bloggers, probably do. Using mixed media in your blog posts gives readers a more complete picture and creates a deeper connection between you and them. The age of reality TV and airing your life unedited is an interesting concept, and if every second of your life is like a soap opera, maybe that’s the best way to present yourself. But, for most of us, we’re just not that interesting 24 hours a day. make a connection with you. Be useful and tell a good story, but don’t bore people with every little detail. Do your audience a favor and edit out all but the essential points. If all that’s left is the most important pieces of the story, don’t hesitate to add dramatic effect. That’s part of being a good storyteller. Sometimes, I have a hard time doing this myself because, when I look back on a story I’m telling, I’m seeing it from a new perspective—one of experience—that my readers don’t have access to yet. That makes me want to downplay interesting parts of the story because I now see it as routine. But, to someone living the experience for the first time through your words, they’re seeing it from a whole different angle. Play it up, make it fun and don’t cheat them of the experience. 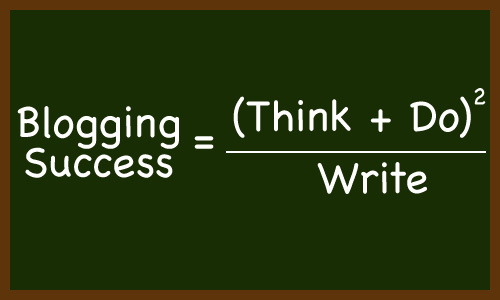 That’s my think/do/write formula for blogging success, but I’m just one person. How do you accomplish this with your own blog? Even more importantly, what you doing? Tyler Tervooren is a thinker, doer, and writer for a team of highly skilled risk takers at his blog, Advanced Riskology. Get his newsletter for more tips on how to be interesting. This was an amazing post. As soon as I finished reading it, I forwarded it to a fellow blogger. I LOVE the Think, Do, Write formula- Awesome. I will do some: Think, Do, Writing today. How can we start our career as a good writer. Which website do you recommend to start writing. Very interesting post! I’m new to blogging and have tried this, but I always wondered if it was the best approach or not (mostly because I wasn’t sure if people were just interested in hearing a story about me). But the results are clear that it is a great strategy! Thanks for showing me something new. My philosophy is that every article I write needs to be incredibly helpful AND tell a good story. You can’t get by with just one or the other. People come back to your site because they found something useful to them, but not every article you write will be the perfect fit for every single reader. By telling a good story in every post, readers that aren’t the best fit don’t feel let down, because they still had fun reading and they come back the next time to see if there’s something more relevant to their lives. New concept of blogging i came across, thanks for sharing specially the do part. Thanks for give me a new way of thinking when I write a post. And Im surprise how difference there are between the two types of writing. Great post! I would never have guessed that adding the “do” into the process would make that much of a difference, but when you think about it, it makes sense! People connect with personal stories and antecdotes and it makes the overall post more remarkable overall. Thanks for the great advice! hi Tyler, great post. Very hot tips for all the bloggers. What I ‘ve seen is that my best articles were those based on my personal experience as a blogger. So, yes, experiences definitely bring better quality to writing and if your readers find they have common things with you they wil listen more closely. This is certainly true. My wife’s blog is much more successful than mine, and she follows this approach. Interesting concept, but as a political blogger, not sure how I can execute this. Sure I can talk about and attend tea party rallies and libertarian meetups and such, but commenting on news and current events is a tough “do”. It’s definitely important to out your own personal spin on everything that you do – people want to read your personality into the post as well as your message. i think infusing your post with “you” is key. In your case, I think it’s just critical that what you’re writing is your own opinions that are formed from your own experiences. In any topic, politics especially, it’s easy to get drawn into the “empty bathtub” echo effect where one person gives an opinion, and then everyone just copies it. That’s a losing strategy in the end. By injecting your own personality into every post and ignoring other’s opinions in favor of being true to your own, I think you’ll do much better. 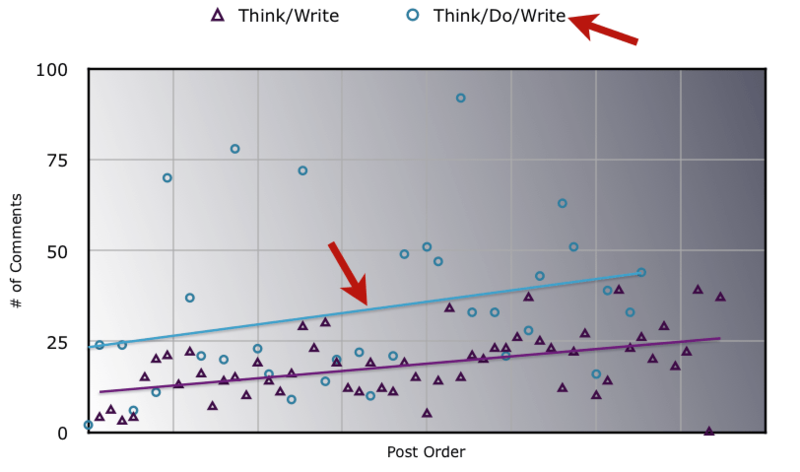 Instead of Think, Do, Write, I went this way: Think about not Doing, then do it and write. I just spend a week at the Oregon coast during what’s called a ‘seismic window.’ Since I did it, I wrote it, but wouldn’t have if not subscribed to problogger and Tyler. Thanks guys. My next shot could be Think about being scared silly, Do it, Write. Thanks for giving this perspective. I literally had been wondering about the approach I was using in my blog–writing about my travel and adventures to illustrate communication issues. I had finally decided not to worry about the stories being about me and just share the lessons or tips, Now the readership is growing steadily. Great post. It is an eye opener. I wlll definately adopt the approach in my blog. I am just learning about how to promote my website and just started doing some article submissions which have given me some traffic. I realized to just take the knowledge I have and put it into writing as it comes out more genuine that way. This approach certainly takes time and sometimes not easy to tell the failure to other people because afraid of the bad impact afterwards although it is not always true. But thanks for sharing the great tips..
I’ve looked back over my posts that were successful and the ones that were less successful and they mostly hold true to your formula. Congratulations, I think you’ve hit on something. I’m going to think twice about writing a post that is think / write and try to figure a way that is think / do / write as often as I am able. Great advice! I’ve found the posts that flow the easiest for me are the ones based on experiences or conversations I’ve had. Experience solidifies learning, and when we couch our learning in story, it makes our ideas more relatable. Story was a teaching tool long before written language. The experiences also add street cred to what we’re saying. Without the personal experience that led us to the learning, all we’ve got is a theory or a copy of something we’ve read somewhere. It seems so simple, but it is really a great perspective. Im also loving the graph. I do notice I prefer to read about experiences people have had and gone through and learned from rather than when they are their planning stage. I wish I had read this when you first published it, Tyler. This week I finally got my planning straight and have been doing what you wrote about. For the time being, I’m using experiences of my past but I want to move on to recent experiences. I’m hoping this will pull things together for me.